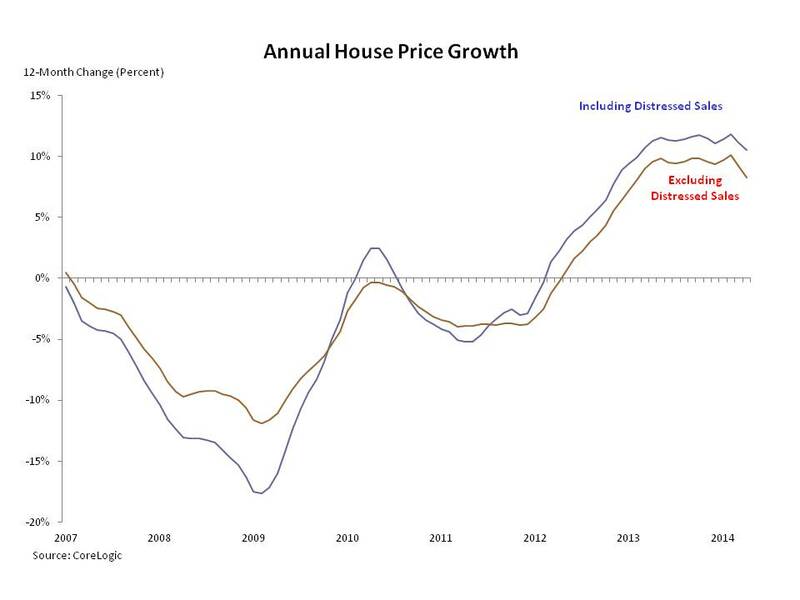 Data released by Standard & Poor’s and Case-Shiller indicates that house prices continued to rise in February 2014. According to the release, the seasonally adjusted S&P/Case-Shiller 10-City Index rose by 0.9% over the month, while the seasonally adjusted S&P/Case-Shiller 20-City Index rose by 0.8% over the month. For the past twelve months these two house price indexes, the 10-City and the 20-City, rose by a not seasonally adjusted rate of 13.1% and 12.9% respectively. The monthly increase in the seasonally adjusted 20-City HPI that took place in February was led by cities in the western portion of the country. According to the figure below, the six cities recording the largest month-over-month increase are located in the either the Pacific or Mountain Census Divisions. These six cities, San Francisco, San Diego, Portland, Denver, Los Angeles, and Seattle all recorded month-over-month house price growth that equaled or exceeded 1.0%. Combined with Chicago and Minneapolis, these six cities also recorded growth rates above the average for all 20 cities. 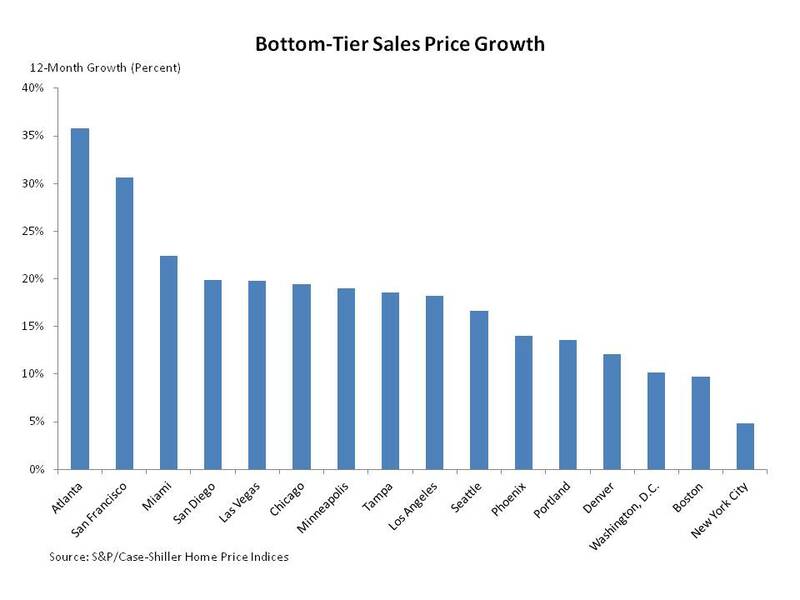 Meanwhile, house prices in Cleveland fell over the month by 0.5%. 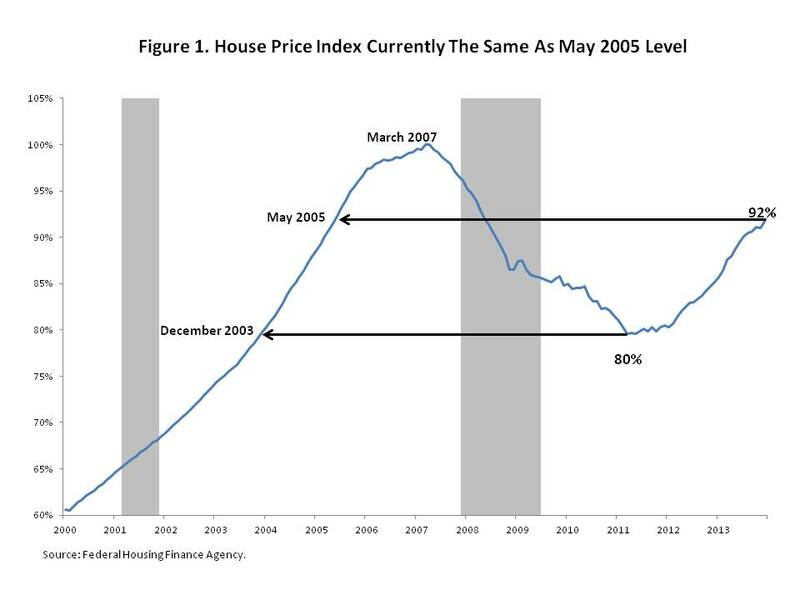 Data released by the Federal Housing Finance Agency (FHFA) indicates that house prices rose by 0.6% on a seasonally adjusted basis over the month of February 2014. In addition, previous estimates of house price gains in January, 0.5%, and in December, 0.7%, were marked down slightly; to 0.4% and 0.6% respectively. February marks the 3rd consecutive monthly increase and the 24th increase in the past 25 months for FHFA’s House Price Index – Purchase Only. Over this 25-month period, the House Price Index – Purchase Only has risen by 15.0% and is now at roughly the same level as in June 2005. National house price appreciation is taking place because most areas of the country are experiencing house price increases. 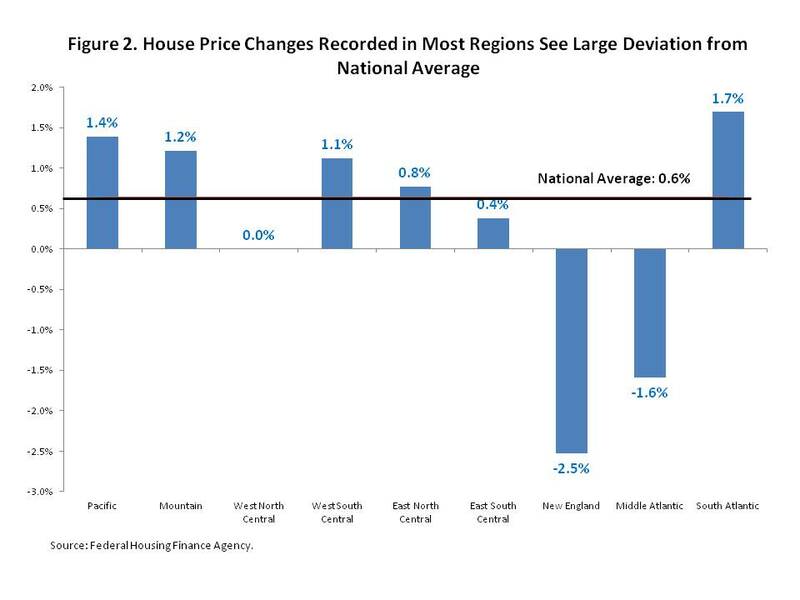 However, many regions of the country recorded monthly house price changes, up or down, that deviated significantly from the 0.6% national average. As the figure below illustrates, house prices in February rose in 6 of the nine Census Divisions, with 4 of these divisions, the South Atlantic, Pacific, Mountain, and West South Central divisions, posting monthly gains greater than 1.0%. 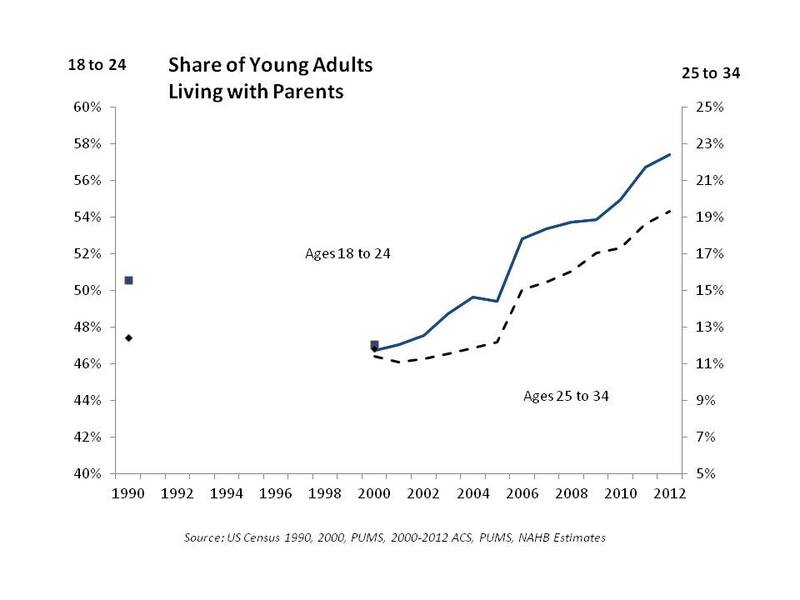 However, these gains were partly offset by declines in other areas of the country. House prices in New England fell by 2.5% over the month while prices in the Middle Atlantic division declined by 1.6%. Meanwhile, house prices in the West North Central were unchanged over the month. Data released by Standard & Poor’s indicates that house prices rose over the month of January 2014. According to the release, both the S&P/Case-Shiller 10-City Index and the S&P/Case-Shiller 20-City Index rose by 0.8% on a seasonally adjusted basis over the month of January 2014. This marks the 23rd consecutive month-over-month increase in both the seasonally adjusted 10-City Index and the seasonally adjusted 20-City Index. Over this 23-month period, the 10-City Index has grown by 22.0% and the 20-City Index has risen by 22.6%. 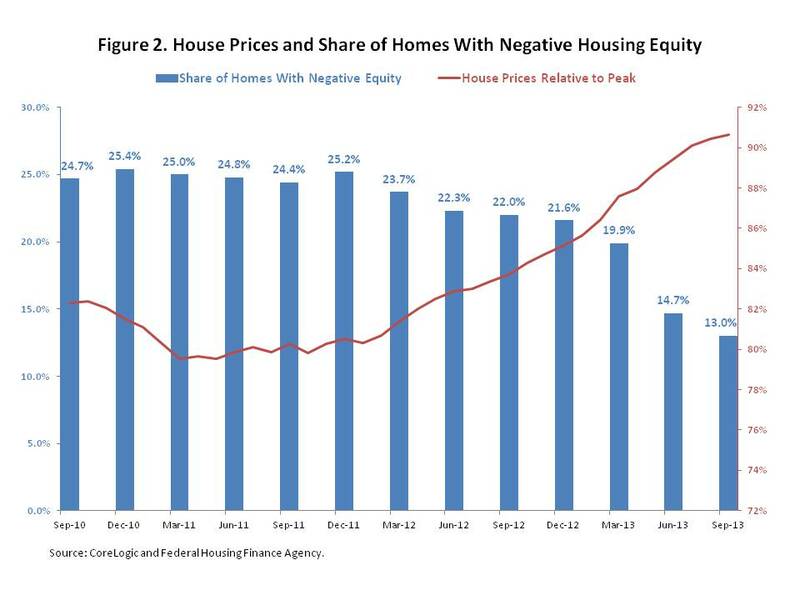 Data from the Federal Housing Finance Agency (FHFA) confirms the monthly rise in national house prices. 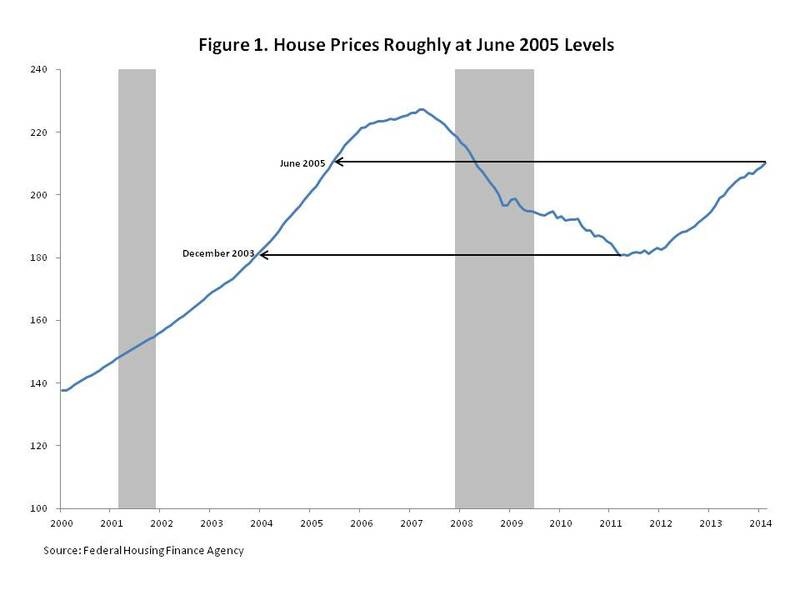 Over the month of January 2014, the FHFA House Price Index – Purchase Only rose by a seasonally adjusted rate of 0.5%. According to the release, this is the 23rd monthly increase in the past 24 months. Over this two-year period house prices have increased by 14.1%. 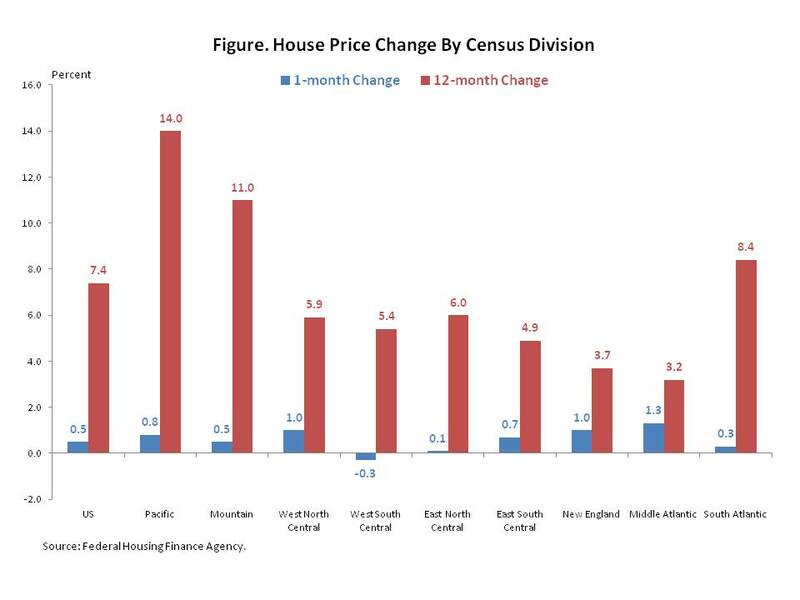 According to the figure below, 8 of the 9 Census Divisions recorded month-over-month house price increases. Only the West South Central part of the country, which includes states such as Oklahoma and Louisiana, experienced a decline. Meanwhile, monthly house price growth was led by the Middle Atlantic, New England, and West North Central areas of the country. The figure below also illustrates that despite the above average monthly gains, these 3 regions of country registered below average year-over-year increases; with the Middle Atlantic and New England regions of the country experiencing the smallest year-over-year price increases amongst the 9 Census Divisions. Data released by Standard & Poor’s and Case-Shiller indicates that house prices continued to rise in November 2013. According to the release, both the seasonally adjusted S&P/Case-Shiller 10-City Index and the seasonally adjusted S&P/Case-Shiller 20-City Index rose by 0.9% over the month. For the past twelve months these two house price indexes, the 10-City and the 20-City, rose by 13.8% and 13.7% respectively. 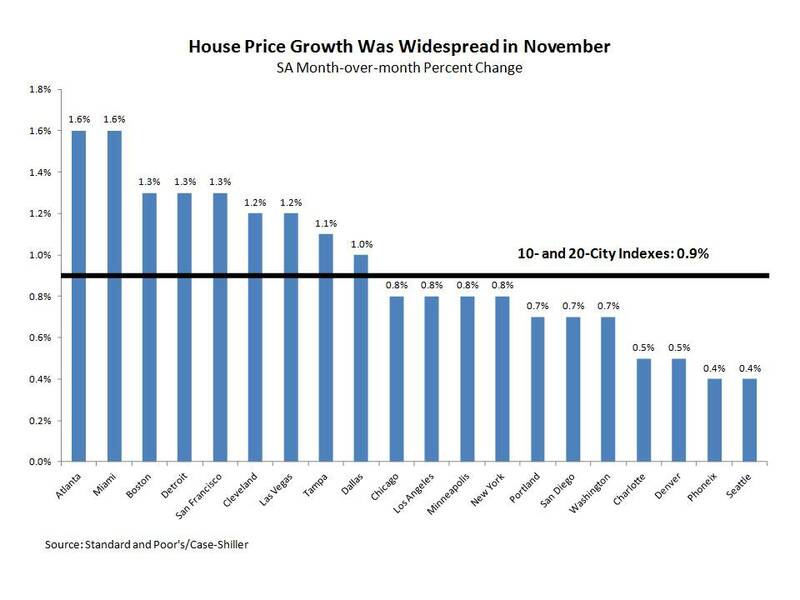 The month-over-month increase in house prices nationally, according to the 20-City Index, reflected gains in each city. 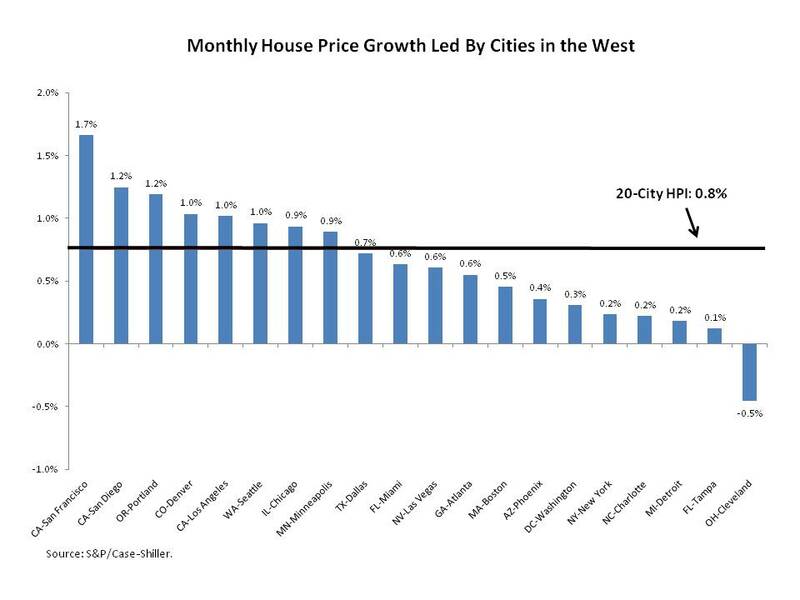 As Figure 1 illustrates, 9 of the 20 cities in the index saw monthly house price appreciation equal to or exceeding 1.0%. Four cities, Chicago, Los Angeles, Minneapolis, and New York experienced house price growth of 0.8%, just below the national average. Meanwhile, Phoenix house prices, which have experienced rapid growth in the immediate past, and Seattle house prices rose by 0.4%.